Low-cost non-stop flights from Paris to Réunion already for €398! Super cheap non-stop flights from Amsterdam to New York €204! Star Alliance cheap flights from Paris to Los Angeles from €251 return! 07 If you can travel light and you are looking for the cheapest option to phascinating Réunion, overseas department of France (and therefore part of EU), consider this latest sale of low-cost airlines French Bee. (formerly French Blue, part of Air Caraibes family). You can now book very cheap non-stop flights from Paris Orly to Saint-Denis already for €398. This is including all taxes and fees but as mentioned this is low-cost option. No checked bag nor in-flight meals are included in base fare. (available for additional €70 at the time of purchase directly at website of the airlines). If interested in this promotional sale of French you will find plenty of travel options in May, June or September 2018. Note that January to March should be the wettest months with subject to hurricanes in this region. Therefore we recommend to choose flights departing after that period..You can check what to expect for an accommodation in Réunion via Hotels.com or Booking.com. The easiest way to check your connection possibilities is through Skyscanner. 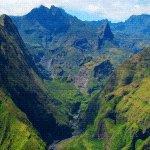 Booking sample of French low-cost non-stop flights from Paris to Réunion already for €398. In this case you would be departing from Paris Orly to St Denis on 15th of September. Your return flights from Reunion back to France would be on Saturday, 29th of September 2018.